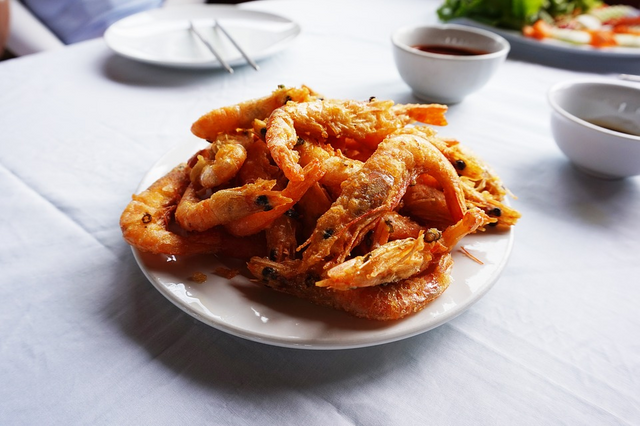 The shrimp or prawns tempura fry is a recipe for prawns breaded in a tempura. 250g of normal wheat flour. 1.- Peel the prawns or shrimp. We remove all the shell, including the head, EXCEPT the tail and the peel that is immediately after the tail. The husks, we store and reserve. They serve to prepare a caldito with them, letting them boil in water for about 20 minutes. 2.- We prepare the tempura. In a bowl we put the flour, the beer, the egg, the teaspoon of salt and optionally the dye and the chemical yeast. The beer will raise the dough while it is fried but the yeast will help it to light more. 4.- Then, fry them in plenty of oil. The oil must be hot but, not too much because, the outer mass is very delicate and it would burn. We fry them in small batches, so that the oil does not cool during frying either.